Photo left - dead ash trunk showing larval galleries of EAB; tree in the background will die within a year. Photos right - The charismatic and diabolical EAB adult. My entomology career might be summarized in key words for the projects I've done: Colorado potato beetle; Japanese beetle; European chafer; Entomopathogenic nematodes; greenhouse biocontrol. 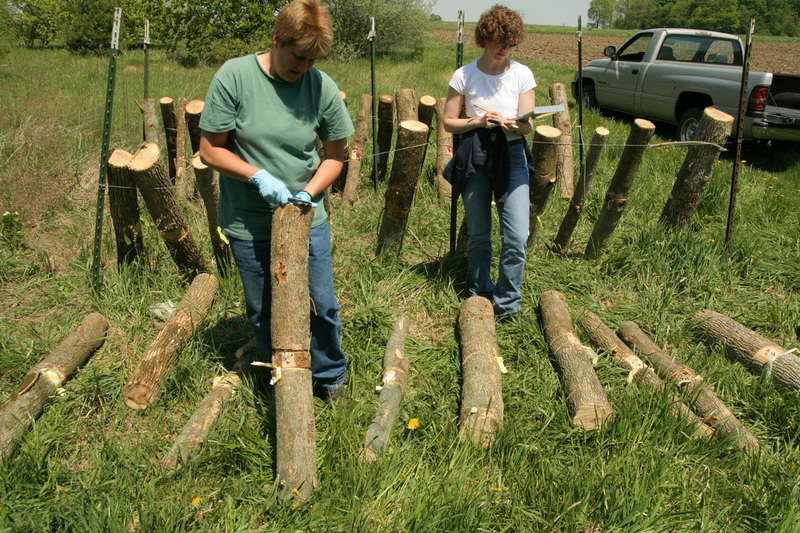 My last topic (2002-2010) was the emerald ash borer, an invasive insect that will likely make ash an uncommon species in North American forests. Ash borers are pests of ash (duh). To learn about them, we worked in urban landscape settings, and in the forest. Our tools were climbing ropes, and chainsaws. I never wore a white lab coat. Inset is a "window;" an area of the trunk where you chisel through the bark and count the larvae by life stage. To get a representative sample, we would take samples throughout the trunk and canopy. The larva is the damaging stage of EAB. 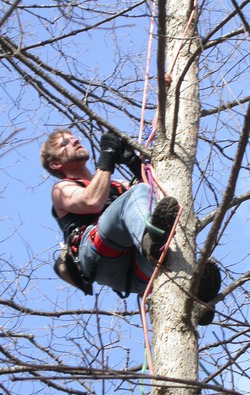 To sample them, you have to climb trees, or cut them down. Nate Siegert, now of USFS, led a project to map and model ash and borer populations in mid-Michigan wilderness. We tagged every tree in several square kilometers, and felled and dissected perhaps 1000. Generally in the winter. Or in the swampy, or mosquito seasons. I worked as a contractor to Mich State, for Deb McCullough (left). 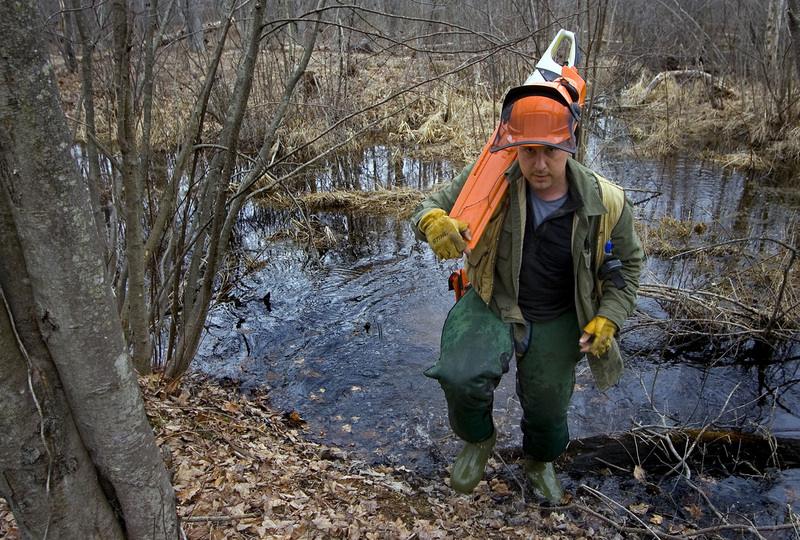 Therese Poland (right) of USFS was a key collaborator. In 2007, I was dissecting like my 10,000th sample, and I found dead EAB larvae, with attached parasitoids, and wasp cocoons. The mortality was widespread. When we reared out the parasitoids, we got this braconid wasp. It had been unobserved for the first 8 years of EAB research, and then appeared in abundance at several Michigan sites. It was a close relative of the dozen or so Atanycolus species, but our taxonomist Paul Marsh christened it as a new species, A. cappaerti. I did not select the name, but I like it. One other time I had occasion to describe a new species. 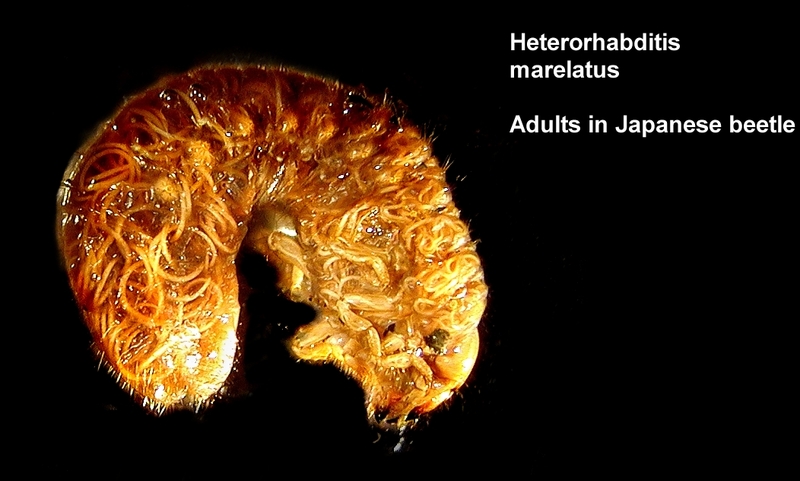 It turns out that many arthropods host gut microbes called gregarines. 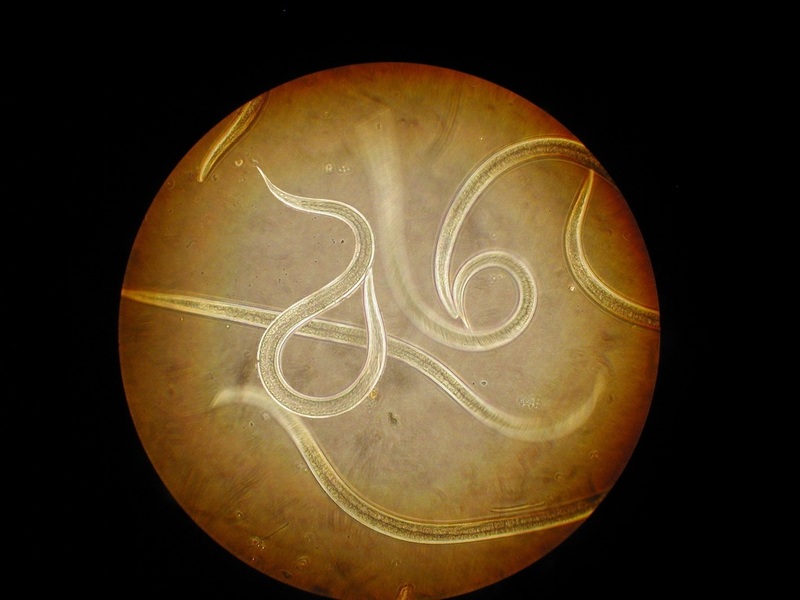 We don't generally know what they do - parasite or commensal. In a survey of Japanese beetle pathogens, we found lots of gregarines of an undescribed species. We named it after a scarab researcher, Mike Villani: Stictospora villani. Nematodes are important pathogens of scarab pests like Japanese beetle (infected cadaver in photo above). A collegue, Albrecht Koppenhöfer of Rutgers, identified a new highly virulent new species, Steinernema scarabaei. My project evaluated its efficacy against the generally nematode resistant European chafer (it was susceptible). 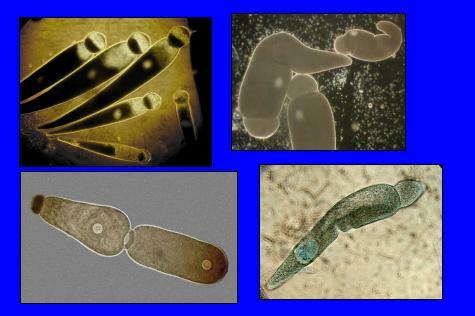 S. scarabaei at about 200X, infective juvenile stage. These little worms swim through the soil, enter the insect's body, and release a bacterial symbiont that quickly kills the host.